Mercedes has been testing the EQC in Spain. 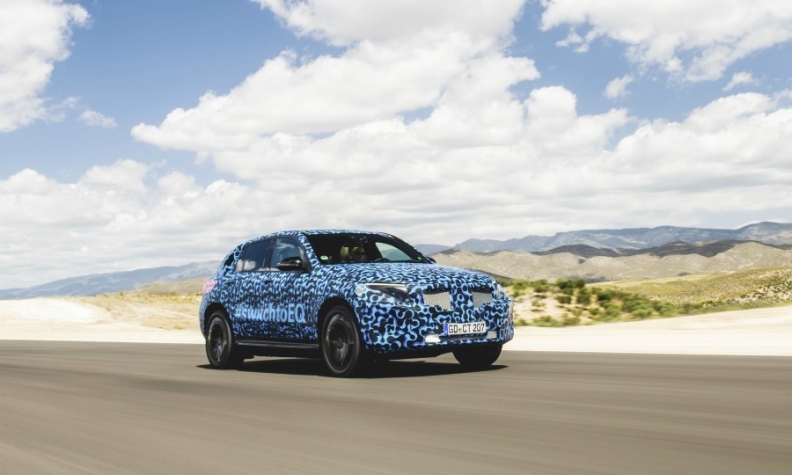 Mercedes-Benz has given a glimpse of its full-electric EQC SUV ahead of its debut in production form on Sept. 4 at a press event in Sweden and later in October at the Paris auto show. The EQC will be the EQ subbrand's first battery-electric vehicle and will go on sale in Europe and the U.S. in 2019. The EQC has been undergoing hot-weather testing in recent months, and this is the setting of the short preview video (see below) that offers a still-camouflaged look of the upcoming SUV. The production EQC is expected to have a 70-kWh battery, good for 500 km (310 miles) in the European cycle. The U.S. EPA-rated range is expected to be a bit below this figure -- about 400 km (248 miles). The EQC will have two electric motors, one for each axle, with a combined output of approximately 402 hp and a 0-100 kph (0-62-mph) sprint time of five seconds. "The EQC is being intensively tested and undergoes a demanding program with around 500 individual tests," the automaker said in a statement. "Prototypes and preproduction vehicles cover several million kilometers on four continents until their market launch. There are also special tests for the electric drive, the battery and the interaction of all drive components." When it comes to size, the EQC will stay pretty close to the dimensions of the GLC class, and that's no coincidence -- the two vehicles will share a platform, plenty of interior parts such as seats and even the same wheelbase. The profile of the EQC will also trend closely to the GLC class, in line with what has been previewed by the EQ concept, but the goal was to give the EQC a family look and easily explained packaging to make it more appealing to those who may be shopping for a gasoline-engine SUV. This electric GLC class approach will extend to the cabin, which will have a slightly more futuristic look but will keep more familiar controls like the column-mounted gear selector, as on the latest gasoline- and diesel-engine vehicles from Mercedes.